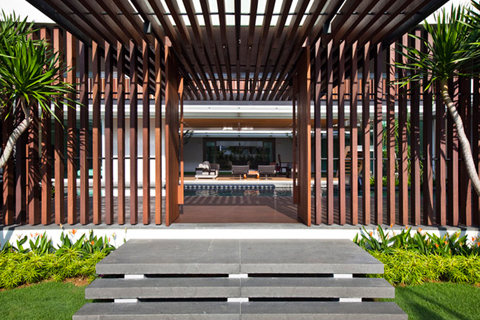 Robin Tan from Wallflower Architecture + Design kindly send us one of their latest projects, the Enclose Open House located in Singapore. The owners wanted a spacious, contemporary house that would be as open as possible but without compromising security and privacy at the same time. Surrounded by neighbours on four sides, the solution was a fully fenced compound with a spatial programme that internalised spaces such as pools and gardens, which are normally regarded as external to the envelope of the house. By zoning spaces such as the bedrooms and servants’ quarters on alternative levels, i.e. 2nd storey and basement levels, the ground plane was freed from walls that would have been required if public and private programmes were interlaced on the same plane. 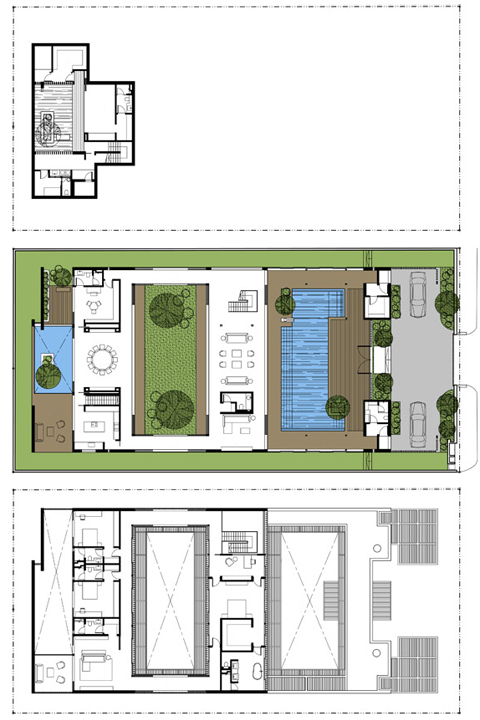 The see-through volumes allow a continuous, uninterrupted 40-metres view, from the entrance foyer and pool, through the formal living area to the internal garden courtyard and formal dining area in the second volume. 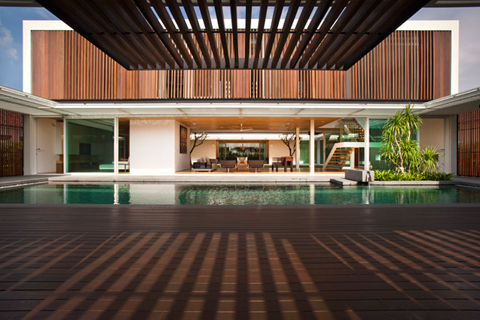 All these spaces are perceived to be within the built enclosure of the house. 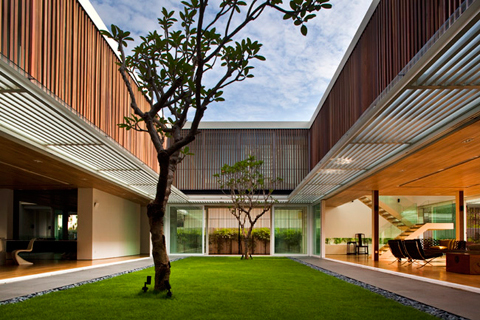 The environmental transparencies at ground level and between courtyards are important in passively cooling the house. All the courtyards have differing material finishes and therefore differing heat gain and latency (water, grass, water, granite). 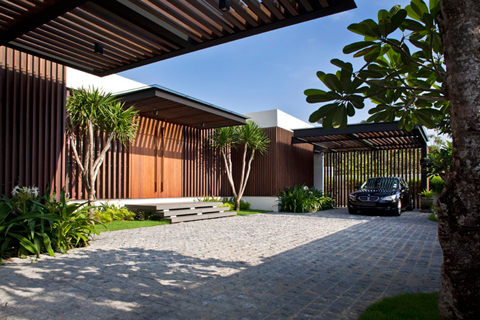 As long as there are temperature differences between courtyards, the living, dining, and pool house become conduits for breezes that move in between the courtyards, very much like how land and sea breezes are generated. 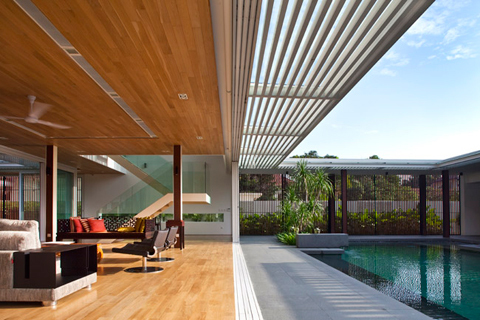 At the second storey, solid hardwood louvers that can be adjusted by hand allow the desired amount of breeze and sunlight to filter through. 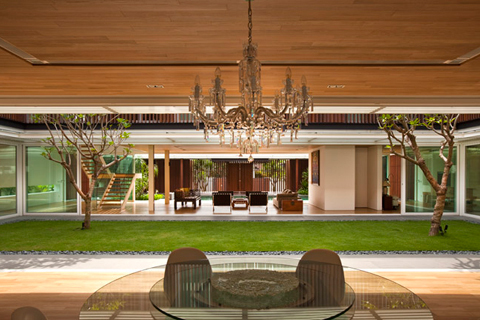 Environmentally, the contiguous and interconnected space encourage the slightest breezes, whether they are prevailing and therefore air-movement is horizontal, or convectionally circulated, which the courtyards help generate. For the owner, it is the experiential serenity that unencumbered space, a gentle breeze, dappled sunlight and the hush of water rippling on a pond that is priceless in our dense and busy urbanscape.